Gummibar I Love You Game App - Gummybear International Inc.
Lucky In Love – The object of this game is to collect as many hearts by tilting your iPhone/iPod’s screen. Beware of the purple gummies though. See how high you can get your score before being hit! Head Over Heels – See how high you can bounce Gummibär in this game. Trampolines propel Gummibär up into the air, and the hearts scattered throughout increase your score. Just be careful of the green trampolines, they’ll disappear and leave Gummibär falling! Flight Of Fancy – Up, Up, and away! Help Gummibär collect hearts in order to send him flying through the sky. Be careful not to miss too many or Gummibär will lose his momentum and start to fall down. Adding more to the challenge, that purple gummy is back to get in your way again! Don’t hit him or it will slow you down. Gummibär returns in 2011 with his second game for the iOS platform. 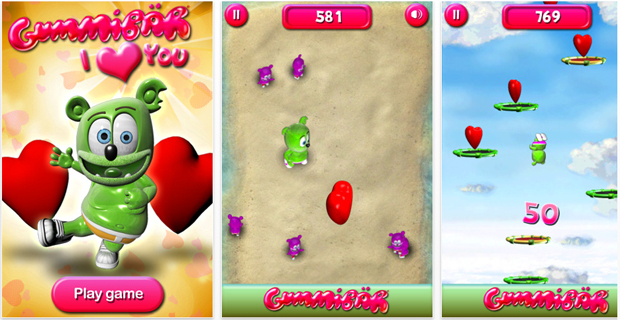 Gummibär I Love You comes with three exciting games, each with their own specific goals and challenges. Whether it is collecting hearts, bouncing on trampolines, or flying through the sky, Gummibär’s new app will entertain you for hours. To make things more interesting, the app also has achievements and is fully integrated with Apple's Game Center App for all those diehard gamers.